The CCA microfilm collection and some books are accessible during their closure peiod - they have been moved to the Templeman Library, Canterbury at the University. They are in the closed collection which means you need to make an appointment, and viewing is weekdays. This situation may continue after CCA reopens later this year (2012), as they ar ereverting to just Cathedral Archives, KCC will no longer be jointly running it. Those interested in the chapel there is a huge amount of information available in CCA and EKA. It was under the care of Deal Borough Corporation for many years. There are many records in the Deal Boough books but also in the church records. The first references are CCA, U3/67/28/30 the Chapel Book 1712-1726, and EKA QC/1 1707-1726. 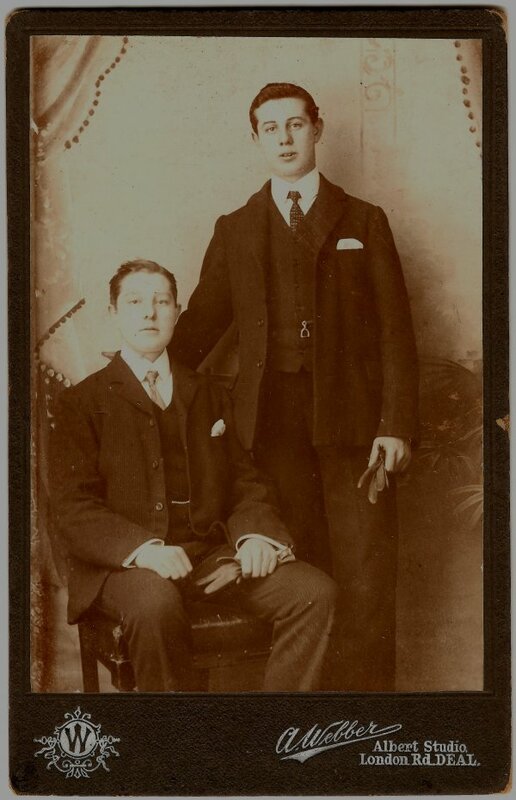 Does anyone have any information about the studio in London Road, Deal, the photographer, or indeed the people in the photograph. Correction: The earlier map is also in the British Library online gallery but its title is St Margaret's Bay. If you search for 'Walmer' you will find it. This map is a larger scale to the revised version. Points to note: It shows Upper Deal Mill, although it is not labelled, and no other windmills. Other items that help to date it are the military features, or lack of them. There is present a 'Battery' on the coast north of Sandown Castle; no Naval Yard and very few Barracks buildings in Lower Walmer. I have recently come across the British Library Online documents and there are some very old maps, drawings etc to do with the local castles and the area. I was particularly pleased to see the OS field book sketch for Deal area drawn in 1797, but updated circa 1815. The first version was not updated, but is only available at the British Library. I have a scan of this and it is very interesting to compare with the modified one. According to a sale document for 22 lots of the estate of Thomas and William Hayman dated 1823-09-15, the Three Horseshoes was sold for £700. The sale apparently took place in the pub, which was then occupied by Henry Stokes. EK/U237/E3. The previous name for the Liverpool arms was 'The Three Horseshoes'. It changed its name somewhere in the 1920's from the evidence we have of its later name in the trade directories. Deal Libarary now expected to reopen after refit duing FEBRUARY 2011. (Correct as of 4th December 2010). If you would like to choose a parish / village and carry out a survey in the same style that IanWi has done for Ringwould it would be of great benefit for other historians. I believe it is fairly easy to do using the statistics on the Historical Population Report website and if you feel adventurous you can use the Land Tax or Church Cess records to extend the time period backwards. I suggest you contact Ian if you feel like taking part. it appears he moved to Walmer in 1841, moved to Upper Deal then moved back to Walmer between 1845 and 1847, so he was in the area for 6 years. I have just photocopied a large number of parish records in the time span 1750 - 1835 from the local studies collection. there are two folders of Vestry minutes for this time span, one labelled Meetings that are type written and give interesting but highly abbreviated reports. The other folder is Vestry Minutes, transcribed in long hand and important sections as photocopies of the originals. Interestingly there are some meetings reports in the first folder not present in the full folder. There was a discusion of how Deal Hospital had moved from Deal parish to Walmer parish and they made an order not to accept any dead from that hospital for burying in their parish. There were also discussions about enlarging the workhouse, creating the new one, buying a patch of ground for the overflow churchyard (the one near the church), Gilbert's system and the introduction of the new Union workhouse in the mid 1830's. These original docuiments are full of details! I also photocopied the complete parish asessment of 1786 to collect money for caring for the poor. There are about 1000 names. This is a complete census of households with occasional insights of details, listing all the poor, because they did not pay. Hope to eventually digitse this lot and put in the archive resource section of this society. Has anyone come across evidencet that 'Back Road' was the former name for Middle Deal Road and that it was called this along its whole length. One of the censuses refers to Back Road being the part containing St Leonards Terrace (the shops) in Upper Deal, which is now part of London Road.